Falls are a major health issue for older people, and falls prevention is a high priority for the Murrumbidgee Local Health District (MLHD). 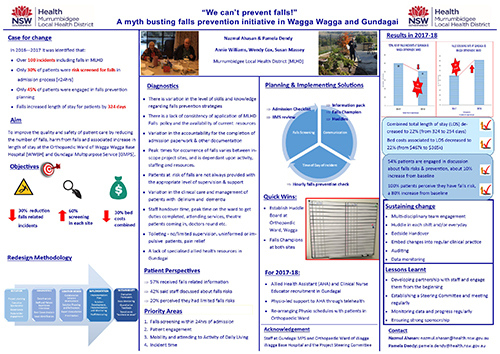 This project implemented changes to improve the quality and safety of patient care by reducing the number of falls, harm from falls, and associated increase in length of stay at the orthopaedic ward of Wagga Wagga Base Hospital (WWBH) and Gundagai Multipurpose Service (MPS). View a poster from the Centre for Health Redesign graduation, August 2018. To reduce the number of falls incidents at each site by 30% by June 2018 (i.e. from 52 to 36 in the orthopaedic ward and from 48 to 34 in Gundagai MPS) and 50% by December 2018 (i.e. from 52 to 26 in the orthopaedic ward and from 48 to 24 in Gundagai MPS). To increase falls risk screening within 24 hours of admission from 36% to 60% in Gundagai, and from 17% to 60% in the orthopaedic ward by June 2018. With a further increase to 100% by December 2018. To reduce combined costs for associated bed days resulting from falls for MLHD in- scope sites length of stay by 30% by June 2018 (i.e. from $467,000 in 2016-17 to $327,000) and 50% by December 2018 (i.e. to $234,000). Early screening followed by falls-focussed care plans will facilitate better falls risk management resulting in positive patient outcomes, fewer injuries and deaths. Ongoing education will provide contemporary knowledge and skills to staff, and assist them in providing a high standard of care to patients. The provision of a Falls Prevention Information Pack for patients combined with staff-led discussion of risk factors and management plans will facilitate improved communication between staff and patients. Regular monitoring and analysis of incident time, with development of local strategies to address the incident time will reduce falls. The proposed falls prevention strategies and solutions are cost-effective and provide increased efficiency within the scope of the current allocated resources. They reinforce evidence-based models into current practices to reduce falls and associated costs. Facilities will have less falls incidents, less complaints, reduced bed days, and reduced costs, which will lead to improvements in efficiency and staff morale. Falls in hospital are associated with a number of patient factors including comorbidities, impaired mobility, cognitive impairment, incontinence, medications, impaired vision, orthostatic hypotension, and physical factors such as environmental obstacles. These conditions can affect length of stay, increase risks of falls, morbidity, mortality, and quality of life for patients. Patients can lose confidence and independence, which affects their discharge destination. Serious injuries including fractures and head injury can result from a fall. A high proportion of falls are unwitnessed despite occurring mostly during the day when staffing levels are highest.1 One-third of MLHD’s facilities are MPS which provide long-term residential aged care. Hospitalisation rates for falls-related traumatic brain injury are almost fourfold higher for residential aged care residents than their community-dwelling peers.2 In 2016-2017, there were 1,082 admissions recorded due to falls for community dwellers. Inpatient falls are the most frequently reported clinical incident in MLHD incident management system with approximately 120/month. In 2016-2017, a total of 100 incidents were recorded in these two sites. Slip and loss of balance were the two major mechanisms of falls (69%, n=69). Total length of stay for acute beds for both sites was 324 days costing $467,000 (based on daily bed cost) excluding surgery and other treatment costs. The project includes implementation of a number of strategies, including several site-specific solutions. The nurse in-charge reviews the electronic medical record (eMR) analytics on each shift. Analytical results are communicated with staff to ensure that screening is completed within the prescribed time. An eMR checklist ensures that the correct forms are completed at the time of admission (including falls screening tool). The checklist is reviewed during clinical handover. All staff members receive training in eMR. An information pack is available for patients on admission, which includes appropriate falls prevention flyers, a booklet and brochures. The falls champions have ownership for the provision of ongoing updates and management of falls information packs. Nursing unit managers have regular quick huddles with staff to monitor their falls strategies and communication with patients; in particular around risk factors and management plan for appropriate use of falls prevention resources. Huddles are held at the beginning of each nursing shift with multi-disciplinary team members. An hourly falls prevention check with patients and residents is embedded as part of regular care. Incident times are closely monitored and appropriate actions taken. The falls risk screening rate, within 24 hours of admission, increased in Gundagai MPS from 36% in 2016-2017 to 48% in 2017-18, and in the orthopaedic ward of WWBH from 17% in 2016-2017 to 37% in 2017-2018. The number of falls incidents decreased by 31% in Gundagai MPS (i.e. from 48 in 2016- 2017 to 33 in 2017-2018), and 6% in the orthopaedic ward of WWBH (i.e. from 52 in 2016-2017 to 49 in 2017-2018). Although the decrease in falls for the orthopaedic ward was small in 2017-2018, there was a significant decrease recorded in the second half of 2017-2018 compared to the first half (16 versus 33). This indicates that there is a gradual improvement in the reduction in the rate of falls. This improvement is supported by nil SAC2 in 2017-2018 as opposed to two SAC2 in 2016-2017. Total length of stay decreased 22% in 2017-18 (i.e. from 324 to 254 days), and associated bed cost also decreased 22% (i.e. from $467k to $365k). The time that incidents occur changed in Gundagai MPS. During 2016-2017, incidents occurred throughout the day and night (e.g. 22 time slots out of 24). In 2017-2018, incidents occurred in 15 time slots and predominantly between 7am and 6pm, for both acute and residential aged care. This indicates that no incidents are occurring during the night and most occur during the day. The reason for this change is that staff are now more aware of the falls and are complying with more evidence-based practices, such as running a daily huddle, bedside handover, patient journey board, timely documentation. Further investigation will be carried out for day time incidents and solutions developed. In the orthopaedic ward of WWBH, the incident occurring times remained unchanged from 2016-2017 and 2017-2018. A significant change was noticed between the first and second halves of 2017-2018. Between July and December 2017, incidents occurred throughout 24-hour time slots (with a total of 19 time slots out of 24), but between January and June 2018, incidents occurred only in 9 time slots, mainly from 10am-3pm and 8pm-12am. This indicates improved staff awareness of falls resulting from the regular huddle, discussion at bedside handover, patient’s journey board, and engaging patients and families. A six-month staff survey found that 54% of staff reported they always discuss falls risk management with patients - a 10% increase from baseline. Twenty three per cent of staff reported that they give away written falls prevention information materials to patients and families - an increase of 14% above baseline. In addition, for 96% of cases falls is discussed during bedside handover- a 16% increase from baseline. Forty-two% of staff are aware of post-fall management action - a 10% increase from baseline. The six-month patient survey also found that 100% of patients reported that they received falls prevention information - a 43% increase from baseline. For the patient’s engagement in care plan development, there was an observable shift towards 'very much' and 'adequate' engagement levels, from a 'hardly' and 'not at all' baseline. Also at baseline, 20% patients perceived that they had limited falls risk but in six months, 100% of patients perceived that they had limited risk. This indicates that patients’ level of self-awareness has increased. This may be an outcome of staff discussion with patients about falls risk factors and management. Develop partnerships with staff and management at the project site, and engage them from the start of the project. Initial problem identification through diagnosis, is more valuable than offering solutions. Run brainstorming sessions with project site staff to generate sustainable and feasible solutions using a priority scale. Make frequent site visits to communicate with staff and patients. Monitor data, including collection and analysis. Share the data with staff at the project site and update them on progress. Establish a steering committee and hold fortnightly or monthly meetings. Strong sponsorship is crucial for the success of the project. Harvey AL, Mitchell R, Draper B, et al. Comparison of fall-related traumatic brain injury in residential aged care and community-dwelling older people: A population-based study. Australian Journal on Ageing. 2017 Jun; 36(2): 144-150. Murrumbidgee Local Health District. Falls Risk Screening, Assessment and Management [internal document]. Wagga Wagga: MLHD; 2013. Murrumbidgee Local Health District. Strategic Plan 2016 - 2021. Wagga Wagga; MLHD; 2016. NSW Ministry of Health. Leading Better Value Care. Chatswood: ACI; 2017.